The Chelsea town house where JACK KEROUAC wrote "On the Road" is on the block. The brick building at 454 West 20th Street where Kerouac hammered out the seminal Beat generation novel in the spring of 1951 has been given a complete ultramodern makeover on the inside, although from the outside it looks unchanged. The building has been split into two units, with an upper four-plex going for $4.5 million and a lower duplex with a garden listed at $2.5 million, according to Christopher Caudwell, an associate broker with Halstead Property. The building's transformation has been a sort of road novel written in brick and wood for Jon Kully, whose parents bought the building, which is 16 feet 8 inches wide, in 1999 so he and his sister, Deborah Kully, would have a place to live while working and studying in New York. Both siblings are architects with an avant-garde bent, and they made the building's interior an experiment in architectural theory. The interior walls are made of frosted glass, so you can see the pipes, ducts and wires inside. "It's a very bizarre design," Mr. Kully said. Mr. Kully, 29, supervised the work, and it is obvious a lot of care went into the project, which, despite its roots in theory, has produced a comfortable home, with stained walnut floors, exposed brick and high ceilings. Kerouac devotees frequently pass by on pilgrimage, Mr. Kully said, although no vestiges of his stay remain. Still, Mr. Kully believes his design is in harmony with the writer's work. "What we were interested in was stepping outside the box, being avant-garde, celebrating infrastructure, being free and liberated from convention," he said. Madonna, the rock star, children's book author and newly minted mystic, has helped buy a Midtown building that will be turned into a Kabbalah-inspired grammar school. The Kabbalah Center paid $5 million cash in May for the aluminum-clad six-story building at 152 East 55th Street that had long been the headquarters of DR. ROBERT C. ATKINS, above, the diet guru. It was here that Dr. Atkins slipped on the ice in April 2003, and hit his head on the sidewalk, sustaining the injuries that led to his death. Rabbi Yehuda Berg, the co-director of the Kabbalah Center, said the group would renovate the building and planned to open a school there by the fall of 2005. He said the cash for the deal came from a fund called Spirituality for Kids, which is partly financed by Madonna. The rock star gives the fund the royalties from her children's books. Rabbi Berg declined to say how much the fund had received from Madonna, but he said the money also helped pay for land in Los Angeles where the group plans to build another school. In an odd twist of Manhattan geography, the new Kabbalah school will be next door to the mosque of the Islamic Society of Mid-Manhattan, at 154 East 55th Street. The Atkins deal was unusual in several ways. A Manhattan doctor had initially gone into contract on the building last fall, but after she learned she had a serious illness, she became unable to close on the purchase, according to her broker, Paul Wexler, president of Corcoran Wexler Health Care Properties. That left the distressed doctor in danger of losing her $500,000 down payment. At the same time, another doctor, who happened to be a Kabbalah disciple, had been in talks to lease space in the building after the purchase, only to learn that the deal was in danger of falling through. He told the Kabbalah Center representatives about it, and they looked at it and liked it. "It was just all bang bang," Rabbi Berg said. "We looked at it and a week later we closed. It was a perfect scenario." And the doctor got her money back. He said that teachers at the school would not be teaching children directly about the Kabbalah but that the Jewish mystical tradition would instead influence the school's philosophy. MIKE PIAZZA has gone into contract on a 3,000-square-foot penthouse condo at 161 Hudson Street, the TriBeCa building that once housed the old Wetlands nightclub, according to people close to the deal. The Mets' All-Star catcher and first baseman agreed to pay close to the $4.25 million asking price, one of those people said. Mr. Piazza did not respond to a request for comment. Piazza is also building a massive house in Malba, Queens. It's a huge single family, detached house in an increasingly ridiculous area. It is a 5 minute drive to Shea and sits on the water, so I guess it's convenient. I can see it from my house. Nice to have money! Lifestyle fashion guru Ralph Lauren, who became a billionaire stitching polo players onto the garments of middle-class shoppers, has expanded his clubby Carnegie Hill place. Sources tell us the arbiter of argyle has just signed to buy a seven-room prewar co-op with a $7.2 million price tag, adjacent to his sprawling duplex apartment at 1107 Fifth Ave.
Sources say he will incorporate the three-bedroom, four-bath apartment - with several rooms overlooking the Central Park reservoir - into his present 8,000-square-foot residence. Listing agents Kyle Blackmon and Amanda Young of Brown Harris Stevens had no comment about the transaction. Long before Bronx-born Ralph changed his name from Lifshitz to Lauren, it was cereal heiress Marjorie Merriweather Post and her second husband (out of four), E.F. Hutton, who owned the original 54-room triplex penthouse in 1107 Fifth, a 14-story building completed in 1925. The Huttons had first owned a large townhouse on that land - which Marjorie had purchased from the Burden family several years earlier. They then sold the house to a developer with the agreement that it would be razed to make way for the apartment building, in which they'd get the top three floors. The ridiculously rich Marjorie Post Hutton had the interiors of the original Burden mansion fitted into their new penthouse. Lauren's home collection also includes a 13,000-acre ranch in Colorado, a 240-acre estate in Bedford and homes in Jamaica and East Hampton. David Byrne's next song could be titled "Bidding down the House," after the former Talking Heads frontman sold his Greenwich Village townhouse for slightly less than his asking price of $5.9 million. Located on tree-lined West 12th Street, a few doors down from the house that Meryl Streep is attempting to unload for $12 million, the elevatored five-story 1850s place, of just over 6,000 square feet, has five bedrooms, three bathrooms, two half-baths and several fireplaces. Byrne bought the house in 1990 for $1.25 million. Agents Rise Cale, Jan Hashey and Leslie Mason of Douglas Elliman did not return calls. Mike Piazza is selling his Gramercy Park penthouse palazzo. The Mets slugger listed his duplex condo on East 18th Street for $2.649 million, after buying a place in TriBeCa. The listing - conveniently linked by esteemed Web site Curbed.com - describes the manly two-bedroom bachelor pad as having a professionally designed screening room and a setback terrace. Broker Louise Devlin of Brown Harris Stevens had no comment. A DUPLEX co-op on East 57th Street that includes the apartment where the actress PAULETTE GODDARD lived with her last husband, the novelist Erich Maria Remarque, has attracted a buyer after just two weeks on the market. James Coleman Hayes, an associate broker at the Corcoran Group, said the buyer, whom he would not name, had signed a contract for close to the $1.795 million asking price. The two-bedroom penthouse, on the 15th and 16th floors of 320 East 57th Street, is being sold by Yolanda Kluge Mann, an ex-wife of the billionaire John W. Kluge. Remarque, who became famous for his World War I novel "All Quiet on the Western Front" moved into the building on June 1, 1951, less than a month after striking up a relationship with Goddard, according to a timeline on the Web site of the Erich Maria Remarque Peace Center in Germany (www.remarque.uos.de). The couple were married in 1958 and, while they spent much of their time abroad, they used the East 57th Street apartment when they were in New York. At the time, their apartment was a one-bedroom on the 15th floor. It became a duplex after a buyer in the mid-1980's combined it with the apartment above. Remarque died in 1970 at age 72, but Goddard used the apartment for several more years. She died in 1990 at age 79. Remarque set a portion of his posthumously published final novel, "Shadows in Paradise," in an East 57th Street apartment that evokes his longtime home. "It was a small apartment on the 15th floor, consisting of a living room, bedroom, kitchen and bath . . . to me it was the height of luxury," the book's German émigré narrator recounts. "The living room and bedroom had broad windows, from which one could see all the way to Wall Street." Later, the narrator, who came to America fleeing the Nazis, rhapsodizes on life in the safety of America: "An apartment!" he says. "Lamps! Furniture! A bed! A woman! A glass of vodka! The bright side of my unfortunate life. I'll never get used to it, and that's all to the good." Goddard was a Ziegfeld girl who went to Hollywood in the early 1930's. She married Charlie Chaplin in 1936. The couple appeared together in "Modern Times" and "The Great Dictator" before divorcing in 1942. Ms. Mann, who bought the apartment three years ago, had a brief Hollywood career of her own. As the actress Yolanda Galardo, she appeared in some made-for-TV movies in the 1970's, and had a walk-on role in the 1979 movie "10." Along the way she made friends with Brigitte Bardot, and a black and white sketch of Ms. Mann by the French star hangs on her wall. The 1,700-square-foot apartment has a 1,000-square-foot wraparound terrace, two fireplaces, two bathrooms and a wet bar. Is there a form of attention deficit disorder particular to high-end real estate? Just two months after buying a TriBeCa condo equipped with a recording studio, the hip hop artist BUSTA RHYMES has changed his mind and put the property back on the market. The rapper, whose real name is Trevor Smith Jr., paid $825,000 for the ground floor condo at 11 Vestry Street in May, according to city records. Now he is asking $1.275 million for it. Monica Novo, a Corcoran broker, said Mr. Rhymes had originally intended to use the property as a New York studio. The condo was fitted with a recording facility when Mr. Rhymes bought it, she said, although there is room in the approximately 2,000-square-foot unit for living space. "Someone can basically reconfigure it and do a live/work situation," Ms. Novo said. Mr. Rhymes has an apartment elsewhere in TriBeCa that he plans to keep. Meryl Streep's husband, the sculptor DON GUMMER, last month sold the Chelsea condo he used as an art studio. The price was $3.8 million. The couple have been very active buying and selling real estate recently. Mr. Gummer's fifth-floor condo space at 206 West 17th Street was a short walk from the couple's Greenwich Village town house at 19 West 12th Street, which is also for sale, priced at $12 million. They put the properties on the market earlier this year, around the time they agreed to buy a $9.95 million penthouse in a new building on West Street. The 5,600-square-foot condo, with entrances on 17th Street and Avenue of the Americas, was bought by Jean Polsky and Chike Chukwulozie, who plan to live there. Ms. Polsky and Mr. Chukwulozie own a high-end children's clothing store called Estella, at 493 Avenue of the Americas. Mr. Chukwulozie said the Chelsea apartment requires some work. "It's completely raw, it's got nothing in it," he said. Asked whether the celebrity link added anything to the experience of acquiring the property, Mr. Chukwulozie said: "None whatsoever. In fact, it takes away from it. I'm sure it affected the price, but that's neither here nor there." Mr. Gummer's ownership of the 17th Street condo was brief but profitable. City records show he bought it in January 2001 for $1.8 million. Woody Allen is no sleeper when it comes to his real estate transactions. In fact, the Woodman's been known to drive some of his brokers bananas. But that should all end soon with the word that the comedian has signed a contract to buy a stately 11,000-square-foot townhouse on East 70th Street. Allen's new home is a six-level elevatored place that had a $15 million price tag. The 28-foot-wide building, which presently houses the headquarters of The Century Foundation, was built for a founder of Federated Department Stores in 1929. The prewar Georgian structure includes two large gardens, a curved main staircase and a rooftop terrace. Once the contract closes (should we say if? ), Allen plans a year-long renovation to convert the office configuration into a grand single-family residence, according to sources familiar with the deal. Since selling his oversized Carnegie Hill mansion last winter for about $25 million, the actor/director has taken an apartment a few blocks away with his wife, Soon-Yi, and two of his kids. Allen is currently paying approximately $25,000 a month on a four-bedroom place in the high 80s, between Park and Madison. Broker Paula De Nunzio of Brown Harris Stevens could not be reached for comment. Publisher, artist, concert pianist and financier Arthur Carter is planning to move one more of his Upper East Side properties. The owner of the New York Observer, who recently sold the salmon-colored weekly's five-story townhouse headquarters on East 64th Street, has now listed an imposing structure that houses his gallery and offices at 28 E. 78th St. for $34 million, or for lease at $200,000 per month. On the market is Carter's 66-foot-wide five-story townhouse of some 10,000 square feet, which he bought in 1998 for $7.6 million, according to public records. He has gut renovated the prewar former home in the past few years. "Right now he's more interested in a lease than a sale," said Corcoran Group broker Neal Sroka, who is co-listing the property with Leighton Candler. "But he will sell." Sources say Martha Stewart and art dealer Larry Gagosian - coincidentally both friends of Sam Waksal who've been in trouble with the government - were separately eyeing the property in 1998 until Cater snapped it up. SOME people will do almost anything to find the right apartment — even buy two in a week. A 23-year-old woman from a wealthy Colorado family was searching for a New York apartment early this year, when her broker showed her a 4,000-square-foot TriBeCa penthouse at 28 Laight Street. The condo in the doorman building was being sold by Joanne Corzine, the former wife of Senator Jon S. Corzine of New Jersey. Ms. Corzine's broker, Patricia Cliff of the Corcoran Group, said the penthouse's 3,000-square-foot terrace appeared to clinch the deal for the Rocky Mountain transplant. "She had to have outdoor space," she said. The woman decided she wanted the penthouse, and her mother, Suzanne Helen of Denver, signed a contract to pay $5.75 million for the apartment, plus an additional $150,000 for a parking space in the building's garage. But after the contract was signed in late January, the young woman cast her eye uptown to the trendy precincts of the newly opened Time Warner Center on Columbus Circle. In late March, Ms. Helen went into contract again, this time on a $4.17 million, three-bedroom, three-bath condominium in Time Warner's south tower. There is no terrace, but there is a fine view of Central Park. City records show that corporate entities controlled by Ms. Helen paid cash for both apartments (and the parking space) in the last week of May — a total of slightly more than $10 million. But would the daughter live uptown or downtown? Less than two weeks after the double closing, the daughter's broker at Douglas Elliman began offering the 28 Laight Street penthouse as a rental property, asking $35,000 a month. There have been no takers, and the monthly rent is now listed at $30,000 on the Douglas Elliman Web site. Meanwhile, uptown, painters and other workers were rushing last week to finish enough of the Time Warner apartment so the young woman could move in, although the work won't be done until late August, according to her interior designer, Brett Beldock of Brett Design. Ms. Beldock said the apartment would be done in neutral tones of "cognac" and beige, with wood floors stained in a shade called "espresso." She said one of the bedrooms was removed to make way for 59 feet of uninterrupted windows in the living room, overlooking the park. The future occupant had the idea of putting a velvet swing in the living room, where she can sit and take in the view. Ms. Helen's family is in the carpet and rug business and owns a major share of Mohawk Industries. Reached by telephone in Colorado, Ms. Helen refused to talk about the family's foray into New York real estate. She also asked that her daughter's name not be used because of privacy concerns. When Ms. Helen signed to buy Ms. Corzine's apartment, it had been on the market for eight months, and the asking price had dropped from $6.9 million. Ms. Corzine paid $3.7 million for the Laight Street penthouse in June 2002, plus an extra $51,000 for the parking space. In the end, Ms. Corzine also chose uptown over downtown. The New York Post reported last month that she is buying an apartment in the Time Warner Center's north tower. Now she and Ms. Helen's daughter will be neighbors. Just a few floors above Ms. Helens' new Time Warner apartment is a three-bedroom condo recently bought by Jacob N. Wohlstadter, a Maryland businessman, for $4.28 million. The June 18 closing occurred four days after Mr. Wohlstadter, 34, became the target of a lawsuit. The legal action, in Delaware Chancery Court, was filed by the BioVeris Corporation, a company founded and run by his father, Samuel J. Wohlstadter, a biotechnology pioneer. The suit charged that the son had misappropriated funds from a joint venture between a company he controlled and BioVeris. It said he used the money to make a down payment on the apartment and to buy a fleet of luxury cars. The younger Mr. Wohlstadter was once a scientific prodigy who graduated from the Massachusetts Institute of Technology at 19, went on to study at Harvard, and later became involved in business with his father. In June, according to court papers, auditors discovered the unusual spending at the joint venture, called Meso Scale Diagnostics. Court papers charge that Mr. Wohlstadter spent $705,744 on eight luxury vehicles, including a BMW Z3 roadster with a price tag of $138,847. The documents also allege he used corporate funds for the $630,000 down payment on the Time Warner apartment, and to buy real estate next door to his home in Potomac, Md. Mr. Wohlstadter responded with an affidavit denying any wrongdoing. BioVeris later said it had been reimbursed for the expenses, including the down payment on the apartment. There was no suggestion that Mr. Wohlstadter used company money to complete the purchase at Time Warner. Last month, however, BioVeris filed a second legal action against Mr. Wohlstadter, charging he "sabotaged" the joint venture by seeking to drain the company of its assets. Not mentioned in the legal papers was that Mr. Wohlstadter's 60th floor Time Warner apartment was bought with separate staff quarters, a little-known option at the posh center that allows residents to buy small studios for maids or other household help. The maid's apartment, on the 51st floor, cost an additional $800,716 and was paid for in cash when Mr. Wohlstadter closed on the three-bedroom apartment, city records show. Both apartments were bought under corporate names, with Mr. Wohlstadter signing the sale documents. A spokesman for BioVeris, which makes testing systems to detect things like biowarfare agents and bacteria in food, declined comment. Mr. Wohlstadter's lawyer, Srinivas M. Raju, also refused to comment. Is Mark Messier retiring? Yesterday we reported that he had listed his West 85th Street duplex for $3.95 million. Maybe that's a retirement prelim, not unlike Shaquille O'Neal's tipoff of listing his 18-room Los Angeles mansion a week before he was being traded from the Lakers. Speaking of Shaq, he's reportedly in negotiations to buy a 19,440-square-foot, uh, shack, on private Star Island in Miami. There's a $20 million asking price. There are still some deals out there if you look hard enough. We found interior designer Stanley Hura's prewar Sutton Place apartment on the market for under $1 million. Hura, whose projects have included the governor's mansion under the Cuomo administration, is selling his handsome two-bedroom, two-bath co-op apartment at 14 Sutton Place South for $990,000. The residence features original herringbone floors and prewar moldings. You can even buy some of Hura's antiques, says listing broker, Bridget Restivo of Alice F. Mason. She also tells us you can have the place below Hura's to create a duplex for under $2 million. MARY-KATE AND ASHLEY OLSEN, the twin acting and merchandising juggernauts who will begin attending New York University as freshmen next month, are building the world's biggest dorm room at the Morton Square condominium on West Street. The twins have agreed to spend $7.3 million for four penthouse apartments in the complex, and they are combining them into a 5,725-square-foot collegiate crash pad in the sky. The 15th-floor penthouse will have two master bedrooms, each with an attached study, bathroom and walk-in closet. Each bedroom will be bigger than many Manhattan studio apartments. One twin will get a south-facing bedroom with views of lower Manhattan and the Statue of Liberty. The other will have a north-facing bedroom with views across Greenwich Village to the Empire State Building and Midtown Manhattan. When work is done, sometime after the Olsens start classes in September, the apartment will also have two guest bedrooms, a screening room, kitchen, breakfast nook, dining room, living room, family room, laundry room and another two and a half bathrooms, according to a floor plan of the apartment submitted by the developer to the state attorney general's office, which regulates condominiums. "They love the apartment; they love the view," said the twins' publicist, Michael Pagnotta. The Olsens, who currently live in Los Angeles, initially planned to buy just two of the penthouse units, he said. Last November, they chose adjoining one- and three-bedroom penthouses on the Leroy Street side of Morton Square, and agreed to pay the developer's $3.2 million asking price. Records submitted to the attorney general's office show that the twins' company, the Dualstar Entertainment Group, went into contract on the apartments on Nov. 11. It took no time at all for word to leak out. In fact, three days before the signing, The New York Post ran a story saying the Olsen twins had bought into the building, triggering a flood of publicity for what was at the time a little-known condo complex under construction in the far West Village. But the twins quickly realized they needed more space, Mr. Pagnotta said, and on Nov. 20 they agreed to buy a third apartment for $1.8 million. As time went by, however, Mr. Pagnotta said, they decided there were a host of design and security advantages to buying the fourth penthouse. In mid-February, they went into contract on the fourth unit, for $2.3 million. The twins became child stars in the television sitcom "Full House," which ran from 1987, when they were still in diapers, to 1995. Their lawyer and de facto manager, Robert Thorne, capitalized on their popularity and squeaky-clean image to create a series of Mary-Kate and Ashley videos and a host of spinoff products, including books, CD's and clothes. Dualstar predicts it will break $1 billion in annual sales this year. Mr. Thorne is also making the move to New York with the twins. The same day they agreed to buy the first two apartments at Morton Square, Mr. Thorne, who is also Dualstar's chief executive, signed a contract for a $3.35 million town house in the complex. In February, he also bought a three-bedroom apartment on the 14th floor, directly below the Olsens' penthouse, for $2.13 million. Lorraine Bracco, who plays a psychiatrist in the HBO series "The Sopranos," has put her three-bedroom house in Palisades, N.Y., up for sale. The asking price is $4.4 million. Ms. Bracco said she is moving back to Manhattan now that her two daughters are grown. "It's a small little paradise," she said of her two-acre parcel on the Hudson River, in an area called Sneden's Landing. The house is being sold by Molly Mason Samett of Mason Samett Associates. Ms. Bracco, who keeps a small pied-à-terre in Chelsea, is looking for a bigger apartment downtown, with the help of Susie Hayes, a broker with the Corcoran Group, who is also an old friend. The actress, who says she is "a big real estate nut" who can't resist an open house, also recently bought a 5,000-square-foot home in Bridgehampton, on Long Island. August 13, 2004 -- Yankee star Alex Rodriguez and his pregnant wife have scouted apartments in a new luxury tower in Carnegie Hill. Rodriguez is on a two-week road trip and it is unclear if the couple has reached a decision about a future home. He was seen visiting the Madison Avenue property and returning the next day with his wife for a closer look. When reached at his office, his broker Adam Modlin declined comment. While the penthouse unit in the building is spoken for, the remaining apartments on the 5th through 8th floors range in price from $7.865 million to $10.475 million. Modlin had walked the couple around the city when Rodriguez first joined the Yanks, but the media circus surrounding their building visits led them to take cover and rent for the short term. Sources say the search resumed recently, and this is not the only apartment that has piqued their interest. Cary Tamarkin, the architect who designed and developed the project at the corner of Madison Avenue and 91st Street, fought the community and then neighbor Woody Allen for several years over the height and design of the new building. The units have 4,000 square feet, five bedrooms and six bathrooms. Included are such deluxe features as real wood-burning fireplaces, herringbone oak flooring, imported British steel windows and real plaster moldings. Units have been selling for $2,000 a foot through Stribling Associates. An additional apartment is available for a nanny, security guard or visiting relatives in an attached townhouse. Those units go from $495,000 to $650,000 and are set aside for purchase by residents who want privacy from help and friends. Word in the Orion thread is that Amani Toomer lives there (350 W 42nd). NEW YORK CITY is full of famous people. And famous people, of course, need someplace to live. But does an apartment or building that was once home to a celebrity — say Frank Sinatra or David Bowie — become more valuable because of that connection? It might to anyone who is a fan of that boldface name. Real estate agents and appraisers agree, though, that an interesting provenance doesn’t necessarily translate into higher property values the way that something more tangible like outdoor space or a full-time doorman does. Still, a home with a pedigree can be easier to market because its history helps it to stand out from the crowd. Brokers say that can be especially helpful in the current market, where buyers seem more cautious and properties are sitting unsold longer. Celebrities trying to sell their current homes usually avoid publicity out of fear that their listing will attract curious fans rather than serious home buyers. But it’s a different story for properties one or more generations removed from the famous person. Owners of those types of listings tend to be proud of their home’s history, and their brokers will not hesitate to use the famous previous owner’s name in brochures and listing sheets. In some cases, a celebrity’s name may be invoked even if he or she merely lived in the same building and not the very apartment that is for sale. A search of listings in recent weeks did not produce anything linked directly to Washington, but there were several properties that brought together an unlikely collection of personalities to aid in their sales. They include, in addition to Sinatra and Bowie: George Plimpton, Spike Lee, Walt Disney, Douglas Fairbanks Jr. and the Brodericks, a prominent family in Greenwich Village in the mid-1800s. Ann Bialek, the Halstead Property agent marketing the 3,000-square-foot $5.295 million listing, said that Sinatra lived in the apartment from the time the building opened in 1962 until 1972, sharing the four-bedroom co-op for some time with Mia Farrow. But the years have taken their toll, in part because the subsequent owner started but never completed some major renovations. The apartment is being sold by the estate of Denton Cox, who was Sinatra’s doctor and who kept much of the apartment just as Sinatra had designed it, including an original 1960s kitchen with a hidden stove top that pulls out, wood paneling in a den and black and white quilted lining on the walls of a closet in the master bedroom. But what makes the apartment really exceptional, Ms. Bialek said, is 2,000 square feet of terraces on two levels and a conservatory that Sinatra had the co-op build on top of his apartment. The conservatory has 18-foot ceilings and a wall of glass overlooking the East River. She said this is where Sinatra would “vocalize” and entertain the Rat Pack. Ms. Bialek estimated that the space could use about $2 million in renovations. “It’s not for the faint of heart,” she said. Directly across the street from Sinatra’s building stand a series of town houses built in 1894 that have been subdivided into a co-op. 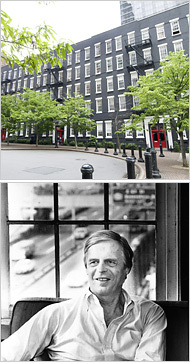 Sometimes known as the “black and white” buildings, they are recognizable to some New Yorkers because their most famous denizen, George Plimpton, once edited The Paris Review from his building here on the edge of the East River. 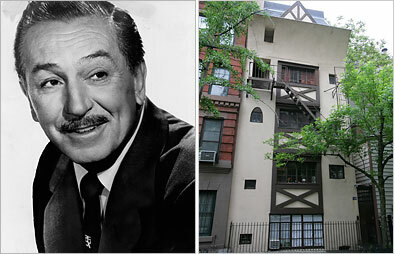 Like Sinatra, he entertained in high style on East 72nd Street. But the apartment where Mr. Plimpton’s widow still lives is not for sale; another space in the building is. Lisa Coghlan and her husband are trying to sell their $559,000 one-bedroom apartment at 527 East 72nd and have been trumpeting the “character and charm” of the “black and white” buildings. At the Essex House on Central Park South, Sonny Thadani, a vice president at Brown Harris Stevens, has a $5.485 million listing for a two-bedroom apartment with views of Central Park rolling out like a lush green carpet as far as the eye can see. The current owner bought the apartment from David Bowie and his wife, Iman, two years ago. Despite the link to the British rock star, Mr. Thadani and his business partner, Gary Lacy, have chosen not to use the Bowie connection in their advertising. But when people come to see the apartment, the singer and his supermodel wife quickly become a topic of conversation because of the custom work they put into the space. Two spaces were expressly created for Iman: an area off the entry foyer that has a delicately hand-painted closet and built-in drawers, and a dressing room off the master bedroom that is essentially a giant vanity, filled with mirrors and a small gold sink. There are also shelves hidden behind moving walls by the living room windows, and Mr. Thadani likes to point out that the current owner completely renovated the master bath, which formerly held a large safe and had been designed as a panic room, where Mr. Bowie or Iman could lock themselves in if intruders managed to get into the apartment. In Fort Greene, Brooklyn, a 1930s firehouse that has been converted into two duplex lofts with a first-floor garage is for sale for $6 million and Scott Kriger, a Citi Habitats broker marketing the property, writes in his listing that it was “leased to a celebrated filmmaker for the past 22 years as a production studio.” Well, it doesn’t take much work to figure out that he is referring to Spike Lee and his production company, 40 Acres and a Mule Filmworks. Mr. Kriger said he had already shown the space to a hip-hop artist who has worked with Mr. Lee, a New York performance group and two doctors’ groups based across the street at Brooklyn Hospital Center. There are at least two current listings in Greenwich Village that highlight the area’s history, both as a bohemian gathering place for entertainment people in the 20th century and as a cradle of sorts for the nation itself. A listing for a $499,000 studio apartment at 102 Bedford Street refers to the building as Twin Peaks. It is a Tudor-style town house built in 1830, converted to apartments in 1926 and once home to Walt Disney and Douglas Fairbanks Jr. Neither Disney nor Fairbanks actually lived in this particular studio, though. And at 52 Morton Street, Ms. Held, the Corcoran agent, represents the owners of a $2.995 million ground floor duplex apartment in a Federal-style town house that dates to 1854. In her listing information, she notes that Morton Street is named for Gen. Jacob Morton, a Revolutionary War commander. She also said that on the day George Washington was to be sworn in as the first president of the United States, the Bible that was to be used apparently went missing and General Morton raced off to fetch another, which Washington ultimately used. So Washington didn’t sleep here, but there is still a tenuous link. The family who first lived in the house were the Brodericks. At last check, Ms. Held — lacking firm evidence that the family is connected in any way to the actor Matthew Broderick, also a Village resident — was continuing her research to try and find out more about them.